The X-Files (Fox) Rated TV-14 | What to Watch. A pair of FBI agents investigates the unexplained. Starring David Duchovny, Gillian Anderson, Mitch Pileggi. I confess, I never did watch the original show, so I can’t compare between the two. I have had it on my viewing bucket list, but there are so many shows, and so little time. That said, I thought this new take on the series was good. I love that they were able to bring Duchovny and Anderson back to reprise their roles. They catch us up on the characters without dwelling too heavily on the past, which I felt was a smart move. Also, I agree with their decision to make this a limited series; it gives the producers the opportunity to evaluate if bringing the show back was the right choice, with the option to extend in the case that it is a hit. I know at least one viewer who is already sad that there are only eight episodes left at the time of this post, which is a good sign. Intriguing and entertaining, The X Files is still worth a watch, even on the second go-around. 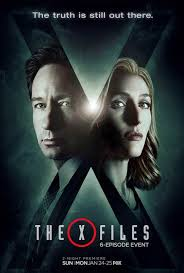 This entry was posted in 2016, Canadian Films, Drama, FOX, Mysteries, Rated TV-14, reviews, Sci-fi, Tv shows and tagged 2016, agents, David Duchovny, FBI, fox, Gillian Anderson, investigate, limited series, lives, miniseries, Mitch Pileggi, older, original, pair, scenarios, series, show, The X-Files, trail, trailer, TV series, Tv shows, two, unexplained, worth, years. Bookmark the permalink. Pingback: New This Week on DVD, June 14, 2016 | What to Watch. Pingback: Michael Massee (1952-2016) | What to Watch. Pingback: Donnelly Rhodes (1937-2018) | What to Watch. Pingback: R. Lee Ermey (1944-2018) | What to Watch. Pingback: New This Week on DVD, September 18, 2018 | What to Watch. Pingback: Scott Wilson (1942-2018) | What to Watch. Pingback: Ricky Jay (1946-2018) | What to Watch.